Wednesday: Scattered heavy afternoon squalls will ice roads again. Highs in the 30s. Overnight Wednesday: An arctic blast arrives, lows around 10, wind chill 20 below zero. Thursday: Bitter cold sunshine. Highs in the teens, wind chill below zero. The system that moved through overnight left us with wet and snowy roads that quickly froze behind the front, which made for a very slick morning drive. Now that the disturbance is out of here, we get to enjoy a few hours of sunshine with temperatures in the 10s to 20s north to near 30 degrees over Southern New England. This will be before the arctic front arrives Wednesday evening. This secondary front will be responsible for snow squalls that will form Wednesday afternoon and move from west to east. The squall line forms in eastern New York around midday and continues its trek towards New England, bringing the chance for a brief burst of snow just in time for the evening commute. The timing is mainly between 4 to 7 p.m., when rapid changes in visibility may occur with near white-out conditions. 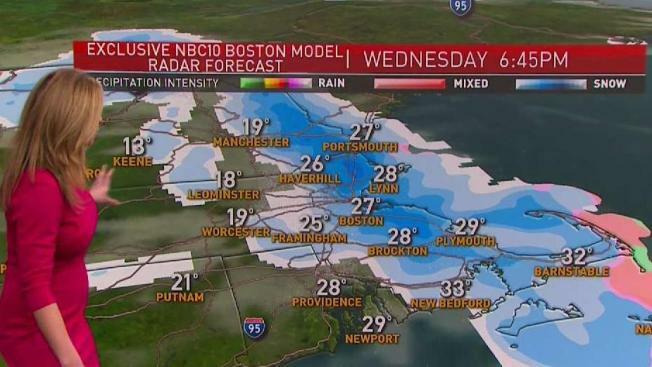 This will be almost like a 5-to-10 minute blizzard, causing major issues on our roadways. Accumulations are expected to be less than an inch with wind gusts up to 40 mph. This front is also the leading edge of that arctic air we have been hearing about in the Midwest, and we will begin to feel the frigid air Wednesday night and especially on Thursday as our temperatures plunge into the teens and single digits. Wind chill advisories and warnings have been issued for most of the region Wednesday night and Thursday morning. Gusts up to 35 mph with actual temperatures in the teens will be responsible for wind chill values between -10 and -30 degrees, so make sure to protect yourself and bundle up as you head outdoors. Don’t forget about your pets too, bring them indoors if possible. This cold air could cause frostbite in as little as 30 minutes. The biting cold air lasts all day Thursday with subzero chills and even into Friday morning. However, conditions will improve by the afternoon, with highs in the teens north and 20s south with lots of sunshine. By the weekend, temperatures bounce back to the 20s and 30s with bright skies on Saturday. As for Sunday, expect to see more clouds and some mountain snow late. Our temperature swing will be impressive over the next 7 days, from the depths of winter to a spring feel come Tuesday. Right now, it looks like next week will be quite unsettled with several disturbances moving through the region with a chance for more rain than snow as it appears to be fairly mild. Stay tuned for the latest with our First Alert 10 Day Forecast.